After a giant alligator wandered onto a golf course in Florida, MSNBC‘s Jose Diaz-Balart had an actually gator in studio — complete with a backdrop to make the little guy feel at home. Ron Magill, the communications director of the Miami-Dade Zoological Park, joined Diaz-Balart in his Miami studio with a much smaller alligator he brought along. During the segment the video walls on the small set that normally show a Miami cityscape were used to display photos of a marsh or swamp. “The Rundown” also uses the monitor for topical graphics, such as showing the White House during political segments. 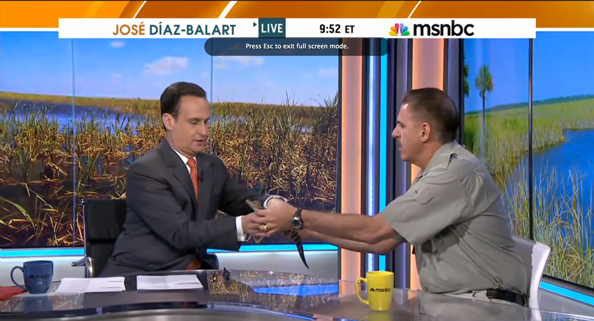 Diaz-Balart then got a chance to hold the critter and asked if he could put it down. “Well, he might run off the thing…” said Magill. Hey, Ron: That “thing” is an anchor desk!